Description: The so-called “Wooden Witch” herself. She was called that by the children of Windagill Valley because of a rumor that she knows everything and everyone, and that she secluded herself in a dark, trap-filled forest to hide from pursuers of her knowledge. In truth, she does indeed know almost everything in the world, but that is a common trait for all Tremen. And she only secluded herself in Old Folk Forest because it was nice and quiet there. As for the traps laiden within the forest, they are mostly just magical pranks she pulls against Toby and the Squites just for fun. However, Abnoba knows more than almost every tree in the entire world for she is one of the eldest of her kind. From her lifespan, she has gained the most knowledge out of all the Tremen. The biggest downside to this though, is that she is incredibly senile. And as such, even though she does know everything, talking to her is a waste of time she more often than not diverts to irrelevant topics too frequently and often forgets what she’s even talking about. This is the reason why the parents of Windagill Valley encourage their children to stay away from her and Old Folk Forest; their senility over grand knowledge is not worth getting lost in a dark forest for. Despite being a millennia old and and being as fragile as a toothpick, Abnoba still likes to move about and is quite the joker. Sometimes she diverts off-topic on purpose just to tell millennia-old jokes, and because she’s a witch, she likes to pull magical pranks on some of the Squites and her pet owl, Toby. Though her tricks are often one-note, she still thinks they’re hilarious, and the other residents just put up with it. 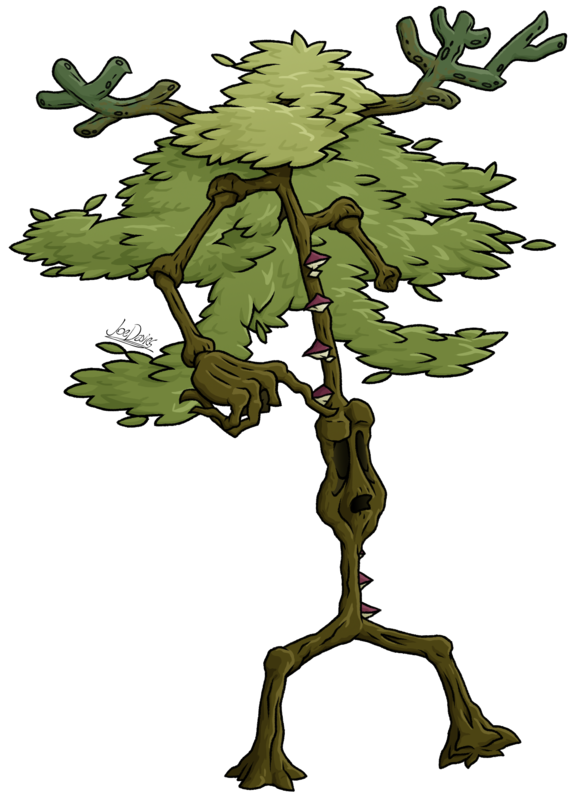 Appearance: Abnoba is a very small and thin tree compared to the rest of her kind. She’s so thin, it looks like you could just snap her like a twig. Yet she somehow has retained excellent posture, and is as straight as a ruler, and her two spindly legs still support her with excellent balance because they are proportionately the same and are at the left and sides of her base. The same can’t be said about her arms, as they are an example of her incredibly old age. Her left arm has shrivelled away and is no longer usable (but she can still move it around), and her right arm, though intact, has seen better days, as the branches from her hand have either excessively grown or have fallen off. Luckily, her right arm is long enough to reach her head so that she can scratch her temple. Another example of her old age is the fungi growing in a spiral formation around her trunk. They are too deep-rooted into her body and thus can’t be removed without damaging her body, so she leaves them there. Her head is positioned just underneath the halfway point of her trunk and is as wrinkly and rough as her old age would lead you to believe. She once had many strong branches stick out from the back end of her top, but the only remnants of them are 2 moldy branches and a molting leafy wig where the leaves have completely covered the back branches, but are still falling off. Her stature is a testament to the look of all Tremen and trees back in the time when she was young; before the Great War of Light and Dark began. This is because apparently Tremen heralded from stick insects,a nd grew in size along with regular trees in the centuries that occurred after the Great War happened. But Abnoba has stayed the same height and width for most of her life. – Old Folk Forest is based on the Black Forest from Germany. And it is from my digging for visual references of the forest that I came across this image. It is this image alone that is the sole influence for Madame Abnoba’s design. Furthermore, the area around this tree is what inspired the Sanctum that Abnoba sleeps in Chapter 4: Identity of the Shadows. – Madame Abnoba was originally going to be called “Madame Evergreen”. But from my research into Black Forest, I’ve discovered one factoid about the area that it was once the place of worship for the Gaulish goddess, Abnoba. Thus, the character’s name was changed to “Madame Abnoba”.